Premier lifestyle and entertainment marketing firm Audible Treats is proud to announce their Fifth Annual Official SXSW Hip-Hop Showcase. 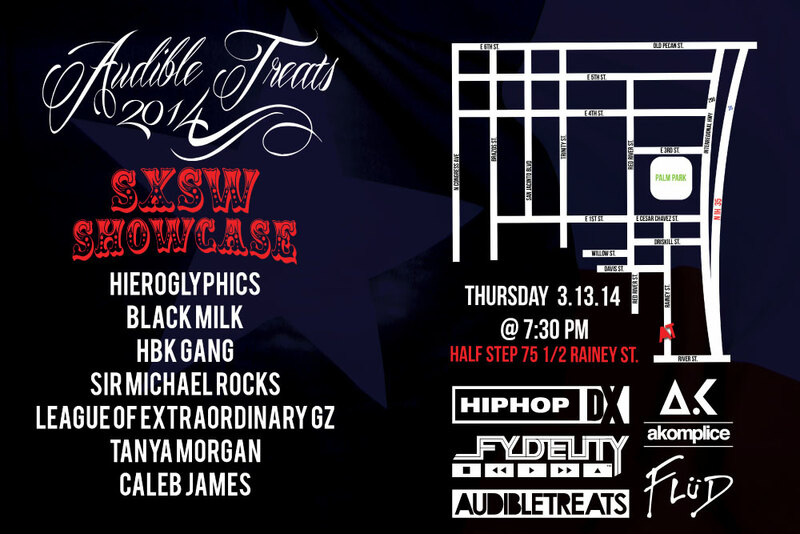 The showcase will take place at Half Step on Thursday, March 13th at 8:00 PM. Featuring artists such as Oakland-based rap collective Hieroglyphics featuring Souls of Mischief, Detroit rapper/producer Black Milk, Bay-Area innovators and refiners HBK Gang (including Iamsu!, P-Lo, Kool John, and more), The Cool Kids member Sir Michael Rocks, hip-hop group Tanya Morgan, SaveMoney artist Caleb James, and Texas rap collective League of Extraordinary Gz, you can expect the showcase to be full of raw talent and great performances. As an official SXSW-sponsored showcase, all badge and wristband holders will be admitted for free; tickets for non-badge holders will be available at the door. For this year’s showcase, Audible Treats has teamed up with premier media outlet HipHopDX, top-flight lifestyle companies Akomplice and Flüd Watches, and speaker-bag manufacturer Fydelity. Audible Treats is a Brooklyn-based entertainment marketing and publicity firm specializing in print and online publicity and social media marketing. Working closely with the best record labels and lifestyle companies since 2004, Audible Treats creates customized, effective marketing and publicity campaigns for countless clients, ranging the spectrum from legacy artists to Grammy-winners to rising stars including Mike WiLL Made It, Iamsu!, Kreayshawn, Amon Tobin, Kool Keith, Hieroglyphics, Black Milk, The Pharcyde, Slightly Stoopid, J*DaVeY, and many more. By combining out-of-the-box creative strategies with industry know-how, Audible Treats plays a vital role in assisting clients to meet their goals. HipHopDX brings readers the latest in hip hop news, rumors, album reviews, interviews, editorials, unreleased audio, hip hop album reviews, rap music videos and mixtapes. Updated daily, HipHopDX not only stays current on hip hop culture but it helps to influence and impact the culture. Akomplice is an innovative clothing line that pushes the boundaries with evolutionary styles and designs. Flüd was founded in 2007 in an effort to bring the watch back as one of the ultimate accessories. Flüd’s goal is to create unique, fresh watches for the casual and streetwear scene without the pretentiousness or price tag. Scratch Tracks is a company comprised of cultural engineers manufacturing music, mobility, fashion and technology for go-go lifestyles. With the incorporation of products from Fydelity and IMIXID, Scratch Tracks focuses on a core genre, but themes of music/sharing, mobility/connectivity, storage/power permeate the designs for smooth blending of their unique grooves.